Traditionally, wood beams are large timbers that are placed in various parts of your house, where extra strength is needed. 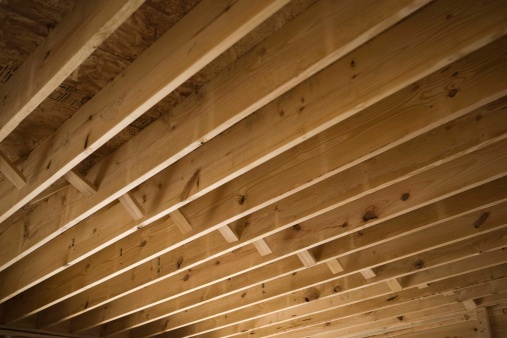 In past eras wood beams have almost always been fashioned from one piece of lumber, but in recent years wood beams are often built from several pieces of wood to help reduce the cost and to take advantage of some modern materials which can actually strengthen the beam. Learn how to make simple beams that can become part of the architectural design and structure of your house. Determine the size and length of the beam that needs to built. This should be done in accordance with the building plans or the architect, who has designed the project. Calculate the thickness of the beam. This is usually determined by the size of the post or supporting wall that is located underneath the beam. For example a beam that sits on top of a 4-by-4 piece of lumber will only need to be 3 1/2 inches wide, if it is to remain flush with the post. However, a beam that sits on top of a 2-by-6 support wall will have an actual thickness of 5 1/2 inches. For simplicity's sake we will plan on building a beam that is 5 1/2 inches wide and eight feet long. It will be made from 2-by-6 framing members, so it will be 5 1/2 inches high. Plan how you will get your actual thickness. This takes some doing for their are several variables. The thickness of the 2-by-6's is not one of them for each board will be 1 1/2 inches thick. And each layer of construction adhesive will take up an 1/8 of an inch, so that is a constant also. Our variables comes with the layers of plywood that goes between each framing member (2-by-6's in this case). So first we need to figure how many pieces of 2-by-6's we meed in the 5 1/2 inches of thickness. Our answer is three and these three boards will take up 4 1/2 inches. Then we will have one layer of plywood between each board. That comes to two pieces of plywood and four layers of construction adhesive. The thickness of the construction adhesive is constant so we calculate that next. If we look closely, we will see that there will be four layers of construction adhesive. 1/8 of an inch multiplied by four will give us a 1/2 inch, just needed for the glue. The final step is to calculate how much room we have for the two sheets of plywood. Since we have 1/2 inch of space left and we need two strips of plywood, our final result tells us to cut two pieces of 1/4 plywood to get the correct thickness of 5 1/2 inches. We will do that first. Cut two strips of 1/4 inch plywood that are eight feet long and 5 1/2 inches wide. Lay on 2-by-6 on top of a pair of sawhorses and add the adhesive, then nail the plywood to the 2-by-6 using 1 1/2 inch roofing nails. Make sure all edges of the plywood and 2-by-6 are flush. Add another layer of adhesive and then place a 2-by-6 on top. Nail these together with #6 common nails. Make sure all edges of the plywood and 2-by-6 are flush. Add another layer of adhesive and then comes another strip of 1/4 inch plywood. Again use #6 common nails to tie everything together. Make sure all edges of the plywood and 2-by-6 are flush. Add another layer of adhesive and then place a 2-by-6 on top. Nail these together with #10 common nails. Make sure all edges of the plywood and 2-by-6 are flush. Turn the beam over and add some more #10 common nails to make sure the beam is tight. Let the adhesive dry and your built-up beam is ready for installation.